Throughout the late 1860’s and early 1870’s, American trade with countries in the Far East, particularly China, was moving along at a steady clip, but things could have been better. To the dismay of American businessmen, Chinese merchants favored the Mexican peso as their medium of exchange, for it contained slightly more silver than a standard U.S. silver dollar. In order to compete in the region, the Yanks were forced to swap dollars for pesos, usually paying currency broker fees. In 1873, Congress sought to negate the peso's advantage and promote American commerce overseas at the same time by authorizing a new coin called the US Trade Dollar. 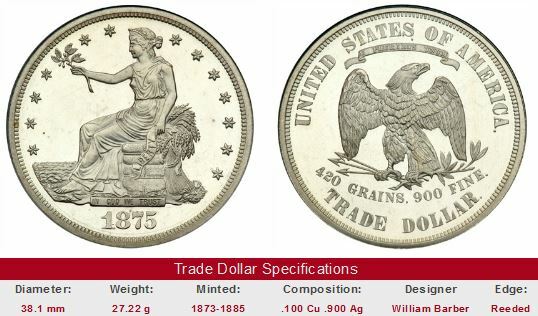 The Trade Dollar weighed 420 grains (.900 fine -- i.e. 90% silver), compared to the peso at 416 grains (.903 fine) and the standard silver dollar at 412.5 grains (.900 fine). The US Trade Dollar design depicted Lady Liberty resting on a cotton bale by the seashore. To her back stands a shock of grain. In her right hand she extends an olive branch, a friendly gesture meant for those on the other side of the Pacific. The reverse shows an eagle with arrows and olive branch in its talons. Below the eagle are the inscriptions “420 GRAINS .900 FINE” and “TRADE DOLLAR”. On the home front, silver Trade Dollars were approved as legal tender in domestic transactions up to five dollars, but nearly all of them produced during the first two years were sent overseas, where they were received enthusiastically. In Peking, China, the US Trade Dollar was proclaimed as the official trade coin in the country, replacing the lighter Mexican peso. At no time since the commencement of the present calendar year has the mint been able to accumulate a surplus of trade dollars, and the public demand has not been fully met…but the favorable introduction of the trade dollar into China has most effectually destroyed the use of the Mexican silver dollar as the medium of exchange between this city and the ports in the Chinese Empire. The Trade Dollar might have achieved its purpose for many years had it not been for events in America. By 1876, mine owners in western states were dumping massive amounts of silver onto the market, sending the silver price into a tailspin, dropping the intrinsic metal value of a Trade Dollar to levels as low as 80 cents. Within a very short period of time, millions of bullion-discounted Trade Dollars flowed back to the U.S., where they were validly spent at face value. To curb this abuse, Congress revoked the legal tender status of the Trade Dollar on July 22, 1876, and ostensibly restricted their coinage to exportation demand only. This did not put an end to the Trade Dollar troubles, however. Unscrupulous individuals acquired large numbers of Trade Dollars at bullion cost and dispersed them at face value to unsuspecting wage earners and merchants, who then tried to pass them on. Invariably, someone got stuck holding a Trade Dollar at a loss. 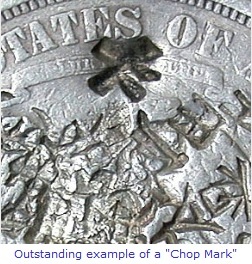 An interesting historical footnote to the Trade Dollar series is the presence of punched insignias, called "chop marks", as seen above. These marks are said to have been created by untrusting Chinese merchants to test the authenticity of a Trade Dollar. Some of the more fascinating chop marked dollars can bring premiums as collectors compete for an unusual artifact that obviously "was there" Chop marks are but another characteristic that makes the Trade Dollar series one of the most unique and intriguing in American coinage. In hindsight, the nation probably would have been better off had Congress instead chosen to altogether stop coinage of the US Trade Dollar and permit its immediate redemption at government facilities. As it was, the Trade Dollar remained in public view, where opportunists repeatedly bought and sold the coin at the expense of others. To compound matters, anyone could receive new Trade Dollars at the Mint in exchange for 378 grains of silver plus a small coining fee! Treasury Secretary John Sherman halted commercial production of the coin in 1878. From 1879 onward, Trade Dollar production was limited to Proof strikes for collectors. But what of the millions of Trade Dollars still in domestic circulation? They continued to be exploited for the same nefarious purposes. Finally, in February 1887, legislation passed that opened the door for redemption of non-mutilated Trade Dollars. About eight million of them were turned in. The rarest of all US Trade Dollars are those dated 1884 and 1885. Issued only in Proof and in quantities of ten and five, respectively, the existence of these coins was not revealed until 1908. They were most likely made "under the table" for a collector buddy of the Mint, William Idler. Despite their dubious origin, the 1884 and 1885 Trade Dollars rank among the most valuable of all United States coins. When a PF-65 1884 sold in November 2005, it brought $603,750. A PF-66 example of the 1885 was sold in January 2006 for an astonishing $3.3 million! Remember, Trade Dollars for these dates were issued only in Proof condition, but many of them have circulation wear. Based on the story above, we can reasonably speculate the motives of those who released them into circulation. High end Proofs are generally unaffordable, but those in lower grades hold promise to collectors likewise, but cost much less up front. Be careful when buying, as there are many Trade Dollar counterfeits in the marketplace, many of which, ironically, originated in China. The best way to protect yourself is to purchase only examples that have been graded by PCGS, NGC, ICG, or ANACS, or at least are being sold by a reputable dealer. The left hand side of the "Sales Box" below is value trend data over a very long period of time for an 1879 Trade Dollar in PF-65 condition. The percent annual increase is computed for comparative purposes, and largely represents the trends for all Trade Dollar Proofs of 1879-1883. The right side of the box is a link to eBay US coin auctions, that pulls the coins, if any, of these dates in all conditions offered. One last warning: Run, don't walk, if the Trade Dollar being auctioned does not meet the selling requirements specified above.